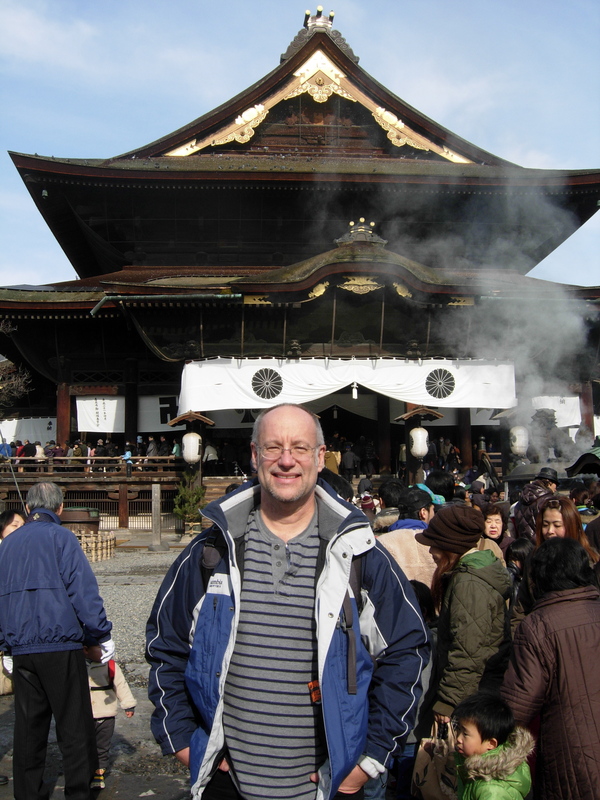 I don’t even know where to begin…I’m taking a moment to update the blog while I’m sitting in a home church meeting in Nagano. If you recall, Nagano was the site of the 1998 Winter Olympics – of course, you knew that! I’m meeting people, shaking their hands, smiling a lot and trying to look friendly and Christian. How does one look Christian by the way. It is totally cool to be able to be in a room full of people who love the Lord in the middle of a very old Japanese city and not understand a word. Who needs to know the language when you can sense the Spirit’s presence from the moment people walk in. We have about 20 people in a small apartment…who said we need “big” places for people to meet. This is a national holiday so this home church is meeting on Monday this week…the holiday is “coming of age” day…when people in this country honor those who have turned 20 years old. Mmmmm..interesting! I wonder how many of us would like to honor 20 year olds. Oh well…so we have spent the morning touring one of the prime ritualistic religious sites in the country. We visited a 9th century Buddhist temple and its grounds. Pictures are posted for you to get a sense of the place. As you recall, Buddhists honor their ancestors and seek enlightenment and guidance from the Buddha for their individual betterment in life. There was incense burning throughout the grounds as people sought purification…there were “fortune tellers” telling people about their futures…and there were hundreds/thousands of Japanese making their “pilgrimage to Nagano to pay homage to their ancestors and to view a statue of Buddha that is only allowed to be viewed very 10 years or so. There are opportunities for a person to have a priest of Buddha pray for them…but it costs…usually about $100 for that privilege. There are statues of Buddha everywhere as well as other statues that represent the spirits that are in the universe to protect people from evil. If you would like to learn more about Buddhism, click here! 3 – Lunch today was in downtown Nagano at a place that makes delicious Japanese noodles…not udon but primarily soba noodles. Now, I sit down with my new friends…they are asking me if the small ”cafe“ is Ok (what am I going to say, take me to Pizza Hut? 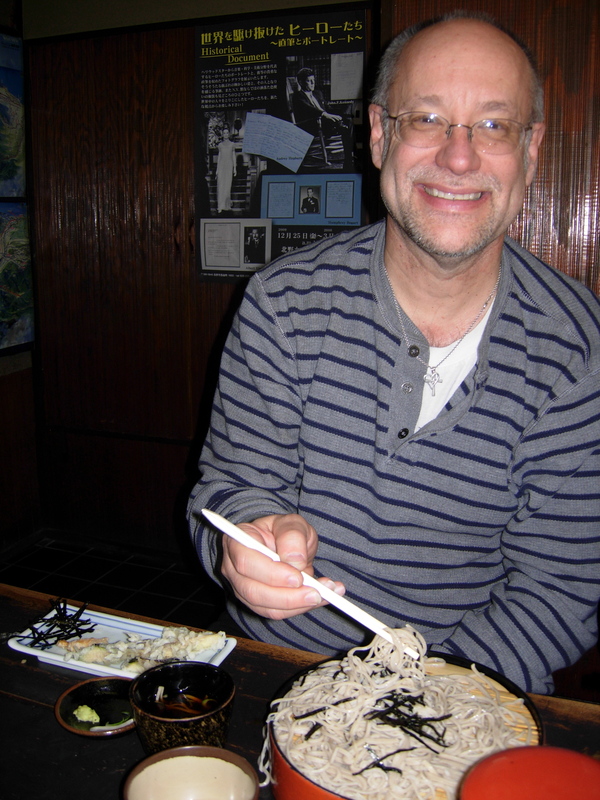 )…so Shingshi orders for us all…noodles and a few pieces of tempura. Now, you eat the noodles cold here…then the noodles come with a healthy ”topping“ of shredded seaweed (yum)…and then you dip the noodles in a soy based sauce…once you finish the noodles, you pour some hot ”broth“ into the cup with your sauce and you drink the whole thing. Green tea with every meal. The tempura was eggplant and some other piece of fish that I was not going to ask about…I just ate it. If you know me at all, you know why I’m spending so much time talking about food…no more needs to be said. No sake for lunch though…more of that to come tonight. By the way, sake goes to your head fast. No more on that! 4 – One comment about the relationship between men and women in Japan…there is a definite ”place“ for women in Japanese society…in fact, everyone knows their role in life…women in this particular Christian fellowship believe that they should wear something over their head during times of worship, etc. Not all do…but many do. When people sit for fellowship, most of the tables are filled with ”just“ men and ”just women“…the chatter is friendly and loving…you can ”feel“ it in the room. Merlyn loves it in Japan because, as he says, women know their place…he regrets not bringing his wife Rayleen back to Japan for her ”refresher“ course…not going to comment on that…otherwise, Meryln won’t be able to return home…he should know HIS place. The rest of the meeting today with the home fellowship was authentically refreshing…there were close to 30 people…packed into this apartment…I'm saying to myself as I'm sitting there (picture below), "this is the New Testament church"…they meet wherever they can…buildings and pastors aren’t the point…fellowshipping, singing, reading scripture…praying…that’s the point – they had a number of first timers there…everyone was enthusiastically greeted…all the newcomers had to introduce themselves. The "format" for today was the same as the church service on Sunday…sharing, scripture, testimony, fellowship – then more food…kids were in a room by themselves. Had some conversation with Singshi – communication happens primarily via the net – chats happen once a week…discussions over the net about the week’s sharing/bible teaching. Communication between people in the fellowship happen because of the passion that people have for their faith – they know they need each other when there are only 1% Christians in the entire country. 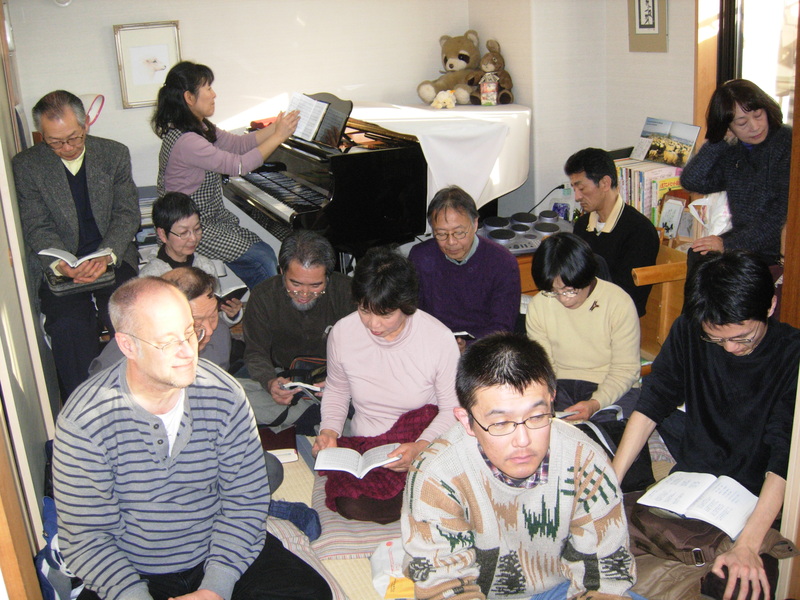 Tomorrow, I'll be leaving early to drive to Tokyo to meet the leader of this movement, Mr. and Mrs. Beck – he’ll be teaching a bible study in Tokyo..I will be visiting the bible study and riding with someone to Tokyo who doesn’t speak English…quiet trip! More to come friends. Oh, by the way, tonight's dinner? Italian food! Different than you would expect, but still COOKED chicken, pork, and pasta…even tomato sauce, bread and salad…a few things that were different – one of the pasta meals had "fresh" fish on it. But all good!